Is made up of various zones. In this tutorial I will define these zones so we can break down the editing process to a step of easy to follow steps. Some Zones need to be edited and some do not. Please do not ever delete ANYTHING from the home page. Simply reconfigure these zones to your taste. ZONE 2 - DO NOT EDIT!!! Uses a Text block, a Summary Block and an Image Block. The Summary Block in this zone has been specially modified so please do not edit the NEWSROOM text or SUMMARY below it ever. If you break it I have to fix it. Is 4 Individual Summary Blocks that each represent an event. When you create an Event, always tag it with the title. Then filter the summary block by tag and search for the title. No need to delete these blocks ever. Just re-filter them to display the event you want to see. This zone is made up of 3 Content Link Blocks. They are similar to Summary blocks but they link to pages and not events or blog items. The last block is a newsletter sign up block connected to your Mailchimp account. This is a Text Block and a Gallery Block set to display as a slideshow. GALLERY BLOCK: This section is a gallery block set to display as a slideshow. It can support both images & videos. Images intended for this section must be at least 1500 pixels wide. Learn more about Gallery Blocks here. 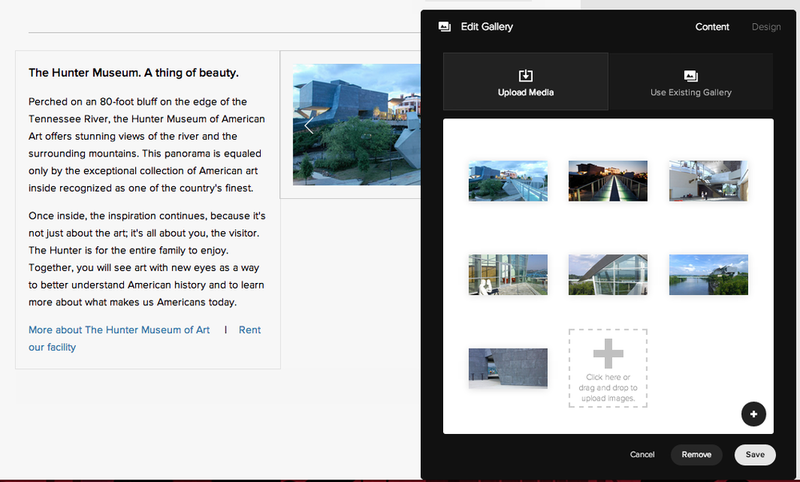 TEXT STYLES: For images uploaded directly into the Gallery Block, click the gear icon that displays when you hover the image to open the Edit Image overlay. Do not enter an Image Title. The Main text in this slideshow is defined by two things Bold Text and normal text. The title of a show should be BOLD and the supplemental information should not. To add a link simply use the click through link below this section. This section does not need to be edited ever. It is customized in the code and if you edit it then it will break. so please... hands off. Each of these Summary Blocks represents an UPCOMING EVENT. As we will get to later in the events tutorial. Each Event needs to be tagged with it's title. Why? 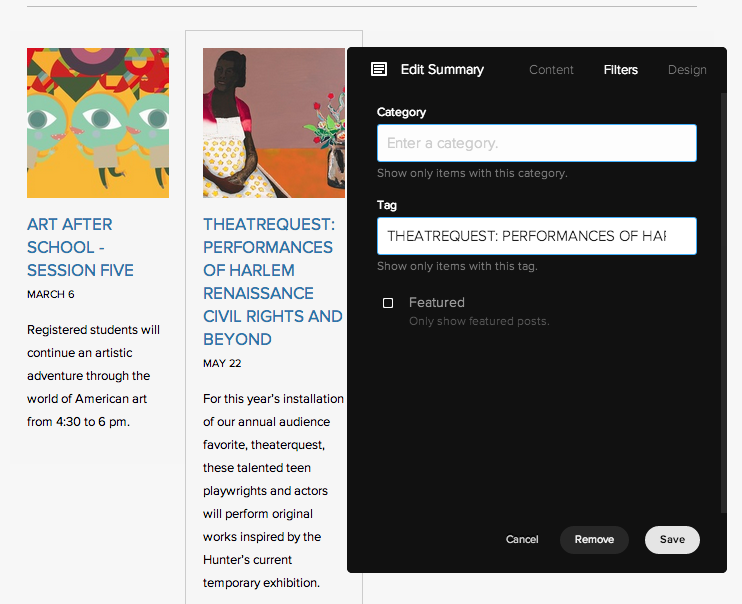 So on this section we can use the FILTER section to search for the Event we want to display by typing in the title in the tags section. No need to ever delete these blocks. Simply filter the block to represent the event you want to promote. The first 3 blocks are Collection Link Blocks and they can connect to any page you want by scrolling through the list of pages that appear upon double clicking the collection link block. Do not delete, simply select another page to represent. Zone 5 is a text block set up next to a Gallery Block. The Gallery represents the Architecture of The Hunter so if you want to add images simply drag and drop them into the gallery block. The text section is just as easily edited.